Note: You should be aware of blender keyboard shortcuts. The keyboard shortcuts are written in uppercase just to highlight them, you should always replace them by lowercase letters. Vases can be a work of art. I had an ancient, beautiful vase in my home, which drew cries of admiration from everyone who visited our home. Then one day my big-brother toppled and broke it. Fortunately, the vase we are going to make in Blender is virtually indestructible. Blender is very powerful modeling and animation package and have very efficient workflow, combination of keyboard shortcuts and the UI make that possible. 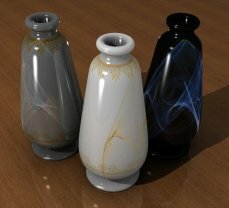 Modeling the vase in Blender is pretty simple, and we are going to take you through the steps to create it. For this lesson we will be using Subsurface modeling. Before we begin lets first explore the Blender interface a bit. 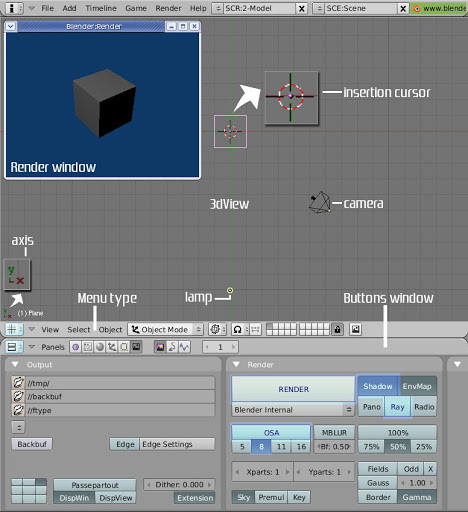 The main interface component in Blender is called a ‘window’. Each feature in Blender has it own window. The window is highly configurable in fact you can change any ‘window type’ to another just by selecting the ‘window type’ from the menu bar. Blender uses ‘windows’ as interface for all feature sets, like the 3dView or workspace, buttons window (this window houses context sensitive tool & options for the 3dView) and all other. Each window can be identified by the icon at the left most part on the menu-panel, for example here how the icons for 3dView and buttons window look like. Blender uses the mouse cursor as the focus point so all the pop-ups will be at the cursor position. In 3dView there is an insertion cursor, any object added to the 3dView will always be at the current insertion cursor position, left click positions the insertion cursor to desired location. Blender have two modes of working, Object-Mode and Edit-Mode . In ‘edit-mode’ you can modify the shape of the model by manipulation its edges, vertices or faces. To get into ‘edit-mode’ first select the object(right click) then press [Tab], press Tab again (toggle) will bring you back to ‘object mode’. In ‘edit-mode’ you the vertices are shown as dots, yellow if selected pink otherwise. Every object have its own pivot point shown by a pink dot, all operations like rotation, scaling and movement act on the pivot point. Right click is used for selection either objects in ‘object-mode’ or editable vertices, edges or faces in ‘edit-mode’. By default the ‘Ray-tracing’ is disabled in Blender. Press [F10](Scene) go to buttons window and on ‘Render’ panel enable ‘Ray’ button. That’s about the very basic primer for your entry into blender world. We will now start on your next masterpiece. In Blender dragging requires first ‘grabbing’ the object. To grab the object select it with right click then press [G] to grab. The accompanying images will have the setting and options highlighted with light blue wherever possible. Whenever we mention ‘Panel’ it always means the option panel in the buttons window. In the pop-ups you can either press ‘Enter’ or click to make a selection.